Rochelle Baxter was an artist recently arrived from Washington State, cruelly cut down in the early stages of a promising career. Now all that remains of her lies on a cold slab in the Cochise County morgue, and Sheriff Joanna Brady knows that murder has once again infected her small desert community. But there is more to this homicide than initially meets the eye: the victim died while under government protection. Instructed to swallow her indignation, Joanna awaits the arrival of the newest member of the state's Special Homicide Investigation team, a man named J. P. Beaumont. Sheriff Brady resents his intrusion and cannot help but make her feelings known. But the road they are forced to travel together takes some unexpected turns, running them headfirst into the impenetrable stone walls of a conspiracy of silence. Brady and Beaumont's hunt is disturbing a very deadly nest of rattlers, and suddenly trust is the only option they have. ©2002 J.A. 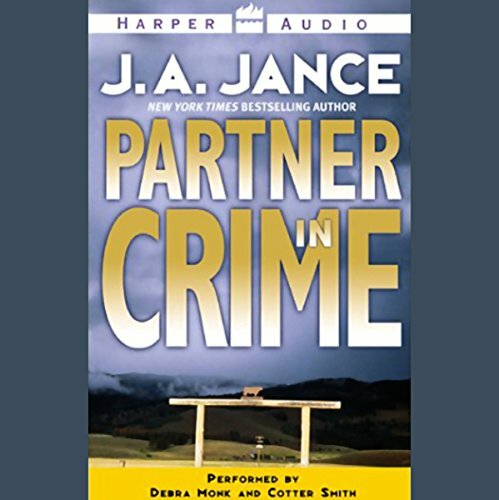 Jance (P)2002 HarperCollins Publishers, Inc.
the narrators. For 16 books Gene Engene has been the narrator and has developed the character of JP exceptionally. His skills make him one of my favorite narrators. Only one narrator. I'm not a fan of multiple narrators. This sounds like old time radio acting out a story. Did Partner in Crime inspire you to do anything? In an effort to be redundant - note to publishers - stick with what is great. Why would you ever replace a narrator in series let alone twice. I had just gotten used to CJ Critt and enjoyed her different voices. It's extremely hard to determine who Debra Monk is portraying most of the time as it is a single voice for everyone. The only break was when the narrator for Beaumont got on (who is also not the original) but he did a fairly good job. Bring back narrator Gene. Why the change? You should not change narrators in a series. After Gene Engene, no one can quite do JP Beaumont justice. The narrator makes the book.